A dog was badly injured when it was stabbed in the eye by a burglar. 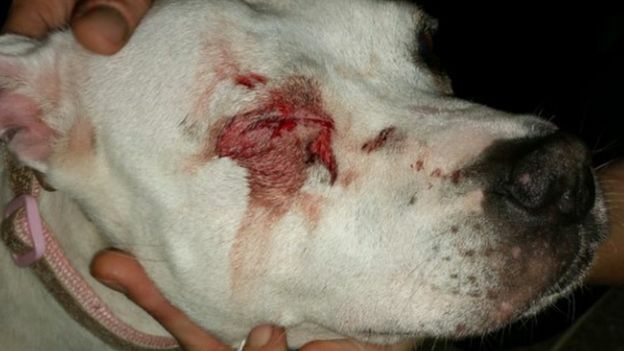 Family pet Lexi was attacked when three men broke into a house in Rokescroft, Pitsea, Essex, on Wednesday evening. The men, all carrying knives, threatened the occupants and slashed Lexi’s eye before leaving with bank cards and cash, police said. Lexi’s owner, who did not wish to be named, said she hoped by sharing pictures of the dog’s injuries, someone may come forward with information. 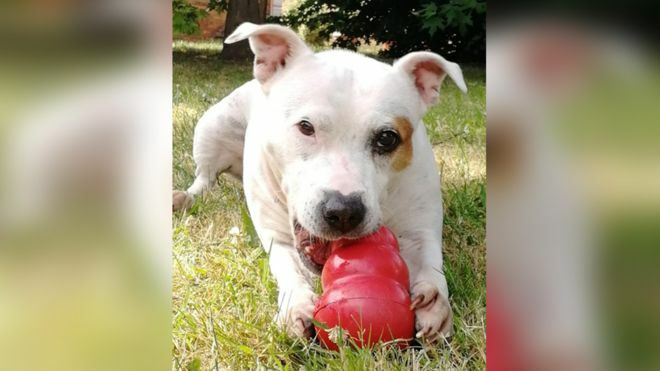 She said the nine-year-old Staffordshire bull terrier is not expected to lose her eye but has been left traumatised by the attack. “Lexi is a very submissive dog and loves cuddles,” the woman said. Since the break-in, at about 22:35 GMT, Lexi’s owner said she had been “very shaken” and was “trying to hold it together”. “If I let myself cry, I’m not going to stop,” she said. “I hope that if people see what they’ve done to my dog, they might have a bit of humanity in them and help police. “These men shouldn’t be getting away with it,” she added. Essex Police said the three men, who made off towards Pitsea Road, were black and in their late 20s or early 30s. This is terrible poor dog. How can these people keep getting away with doing these things. We have more CRIME yet LESS police. How can this be right.? Bring back more police we need them. Some people in some areas are fearing for their lives. This beautiful dog has been found ..
Is the owner looking for it? I’m unsure where to post this picture.. Hoping you can help…. Thank you!